Understanding the importance of cleaning fish properly can be essential to your health. 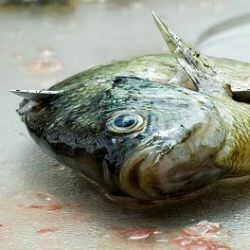 It's important to practice and maintain good habits to prevent one from becoming ill.
Once a fish dies, it immediately begins to deteriorate rapidly, which is why it's best to keep the fish cold, and even better, to clean it before icing it down. A clean fish is a healthy fish is a good tasting fish is a healthier you! Keeping your catch as fresh as possible. Proper utensils and tools to use. How to clean a variety of fish. The best thing is to ensure that your catch remains as fresh as possible. Keep the fish alive in the water whenever possible - either on a stringer or in a basket. Live wells in boats, and tubs or coolers with an aerator, are also another excellent way to help keep fish alive. Here are a couple quick tips before we begin to go over those easy methods and techniques about cleaning fish. You can use the flesh remains from the bones and the head as a stock for the base of soups, sauces, and chowders. So, consider preserving them for later. You may want to place newspapers under your work area to manage an easy clean up. Use water sparingly on fish because it tends to firm them up. Having the right tools for the job will definitely make any job a lot easier. You finish much quicker and with less of a mess. 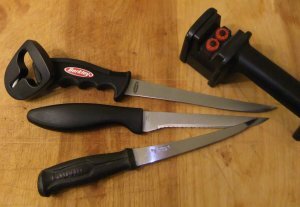 You can still get by with what you have in your kitchen, but here are a couple things that will help you clean and fillet fish more efficiently. Choose a fillet knife that fits the size of the fish. Short fillet knives tend to be firmer, as longer knives are more flexible. It's important to keep your blades sharp for superb quality cuts. You can use a honing stone or a sharpening steel to do so. An electric fillet knife can also be used. However, I personally prefer to use a regular fillet knife. I just seem to find it easier to feel my way through the fish and along its bone structure. 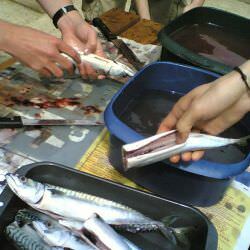 Field dressing is just a fancy way of saying that the fish will be prepared to cook by removing it's guts. Optionally, the head, gills, fins and scales can be left in tact or removed, depending on preference. Once you've gutted and cleaned your fish, you may get the urge to start slicing up some nice steaks to throw on the grill. 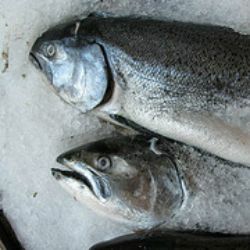 If you aren't planning on using a whole fish to prepare it to cook, then filleting them is a great option. It's actually quick and easy, with minimal mess to deal with. Catfish don't have scales and require slightly different techniques for cleaning. There's a couple different ways to prepare them. They can be skinned first and then cleaned. Or they can be filleted with the skin on. 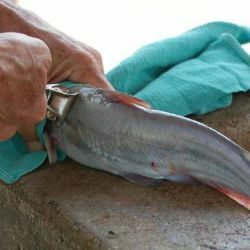 How to clean catfish by filleting them with the skin on.